Want to see some great guitar playing? Then watch the new video from Imarhan. Tumast is the latest track to be taken from their recently released, much-acclaimed second album, Temet, released earlier this year. 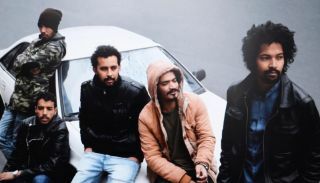 The young 5-piece band from Tamanrasset in Southern Algeria have been described as the ‘new–wave of Tuareg music’. They released their debut album in 2016 to much acclaim, gaining radio play on BBC 6Music and touring Europe, the U.S. and China. They’ve supported Tinariwen, Songhoy Blues and Mdou Moctar and played at the likes of End of the Road, WOMAD and Port Eliot festivals. With devastatingly fast lead guitar lines and a bubbling bass part, Tumast is a must-hear for anyone interested in African music today and not just the influence it had the blues we know and love. The video is taken from Children Of Tam, a 1-hour documentary about the band directed by acclaimed independent film-maker Vincent Moon which was premiered in February at the Clermont-Ferrand Film Festival. Buy tickets here. Visit their website.